Freeway commuting was sucking the life out of a Los Angeles wife and mother of two. To preserve her sanity, she and her family decided they would be willing to downsize if it would get them closer to work and school. So they scooped up this cottage — along with the services of interior designer Charmean Neithart, who helped the family figure out how to adapt their lifestyle to their new living quarters. “This house has made their life easier, simpler, more relaxing and more about the things that really matter,” Neithart says. 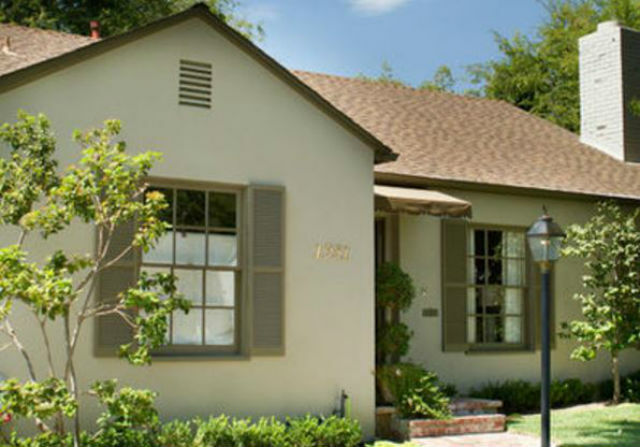 It took about two years to plan the move from the family’s larger, traditional home, so the wife was ready for some big changes. “She told me, ‘I’ve been so stressed out on that freeway that I just want to have fun! Make it a little bit silly and bright and funky — I just want to have a good time! '” Neithart recalls. 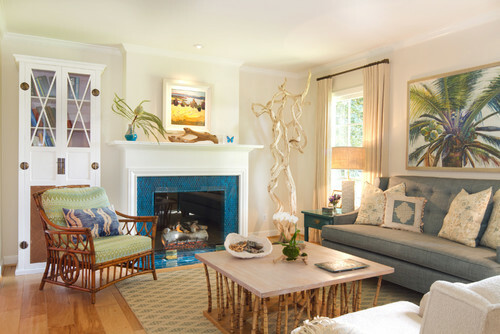 Although the neighborhood is located in the foothills, the homeowners love the shore and coastal colors, and wanted to have a relaxed, beachy feel at home. Structurally, Neithart had the floors replaced and added crown molding throughout the house. She broke open a few walls, and added transoms and a skylight to a bedroom that did not have any windows. The Case for Using Crown Molding. The palm tree painting was another early find that she knew would add to the relaxed California beach vibe. 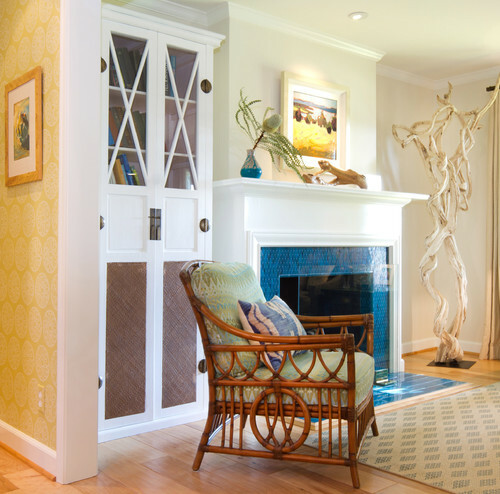 Part of shedding all of their old traditional furniture and living in a new way involved mixing in more modern pieces, like the glass fireplace screen, which reflects light and does not intrude into the room. Most of the furnishings from the clients’ old house were too large for the cottage, so they started from scratch with almost everything, except for their beds and this sofa (which Neithart re-covered). “It’s important to mix in textures beyond the upholstery,” Neithart says. When she found this bamboo-base coffee table at a warehouse full of wayward custom furniture, it was dark brown. Like the bamboo coffee table base, this chair from Palecek adds interesting texture, and also a dash of British colonial style. On the other side of the fireplace, twisted pieces of liana vines resemble beachy driftwood. Neithart recognized that the bookcase was Palecek when she spotted it in a vintage store (the cabinet was dark brown at the time) and knew it was a great score. Part of living smaller means paring down possessions and then having storage for everything that’s left; pieces like this are paramount. By the way, do you know about lianas? I’ve seen them around Houzz many times but didn’t know exactly what they were until now. They’re a very invasive vine that grows in tropical forests and strangles trees — but they make beautiful sculptures once they’re cut and dried. The clients also love natural elements and organic shapes, which inspired a lot of the design decisions. Most of the small accessories around the house are natural elements, like shells, rocks and driftwood; they make the family happy. Previously, the cottage had a closed-in feeling that made the wife somewhat claustrophobic. She also loves to cook and have extended family over for big dinners, and worried that the new dining room would not be able to accommodate everyone. “I told her she was going to learn to use her house differently, that we would open up the rooms and use the whole house for these get-togethers,” Neithart says. For that purpose she expanded the opening between the living room and dining room by 4 feet. The Malibu Fish Plates on the wall are a funky turquoise touch and a great fit for the wife, whose sign is Pisces. The irregular arrangement — with some hung vertically and others facing the opposite direction — adds whimsy. 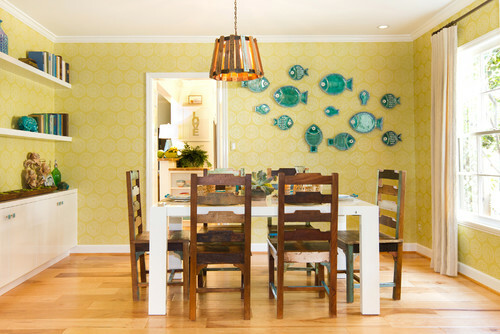 The wallpaper amps up the green in the palette to a true chartreuse. New built-in cabinets and shelves are just 12 inches deep, allowing enough room for storing wineglasses and linens without intruding into the room. The knobs are sea glass, custom made by Uneek Glass Fusions; Neithart found the shop on Etsy and highly recommends it. “You can send her a paint chip, and she’ll blow the glass to match the color,” she says. The color palette continues in the dining room, as does the mix of primitive and contemporary. “I wanted to pair the very modern, Parsons-style table with something super rustic and funky,” Neithart says of the dining chairs, which are made of reclaimed wood. The light fixture is also fashioned from reclaimed wood pieces. Rustic Decor Touches for Every Part of the Home. Table settings are a fantastic way to add more color, pattern and texture. The full kitchen remodel will happen after the clients settle in and rebuild their remodeling war chest. For now the room has new floors, as does the rest of the house. Neithart had the door painted turquoise, added the upper butcher block counter to create a breakfast bar, brought in new window treatments and switched out all of the knobs on the cabinetry. The rest of the kitchen was already fully functional and fine for now. Light colors and French doors give the cozy family room an airy quality, making it seem more expansive than it actually is. Neithart custom designed the comfortable sofa; the rustic coffee table was a flea market find. Structurally, the room has new speakers, ceiling lights and transoms that share light with an adjacent bedroom. 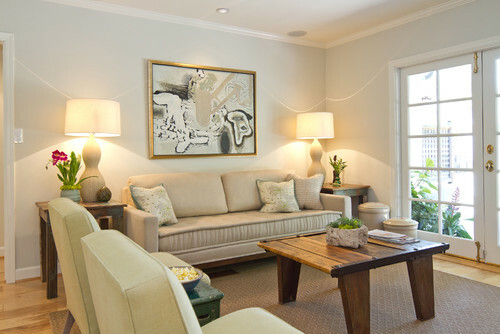 The painting and lamps here add the organic shapes the clients are so fond of; the planter on the coffee table is a rock with a dent in the middle of it. The slipper chairs are a hand-me-down from the wife’s mother; Neithart had them re-covered in a very pale beachy green. 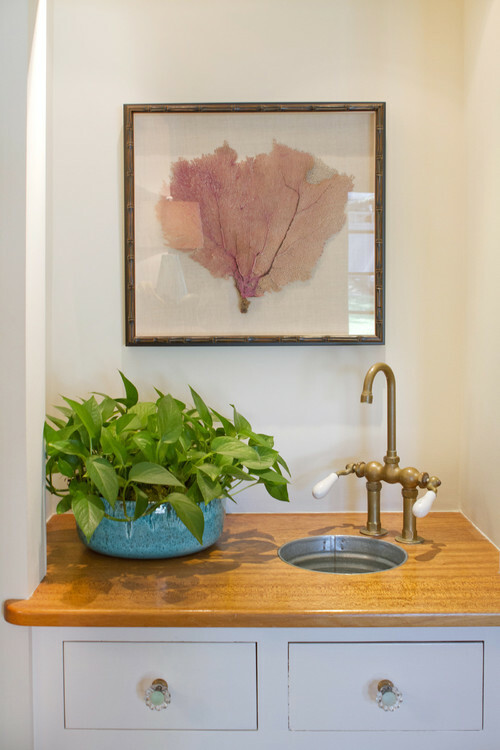 While the client’s first instinct was to get rid of the sink made from a bucket, Neithart told her, “No way! This is cool.” Also, the brass fixture is totally in style and adds a funky shape. Unique Bathroom Faucets for a One-of-a-Kind Look. The teenage daughter had recently completed a six-week Spanish immersion program in Nicaragua. 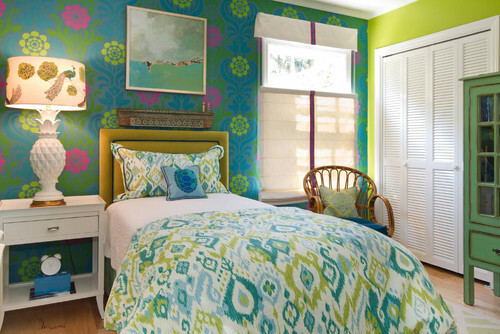 She came home inspired by all of the bold and bright colors used in Latin American design, and wanted an ethnic look in her own room. Neithart started by getting her stamp of approval for the bedding, and took off from there, custom designing the headboard to match. “I just kept buying really funky things for this room,” Neithart says. The occasional chair and pineapple lamp were vintage finds; she topped off the lamp with a shade from Anthropologie. When she came across the wallpaper, it jumped out at her and she knew it was the one. 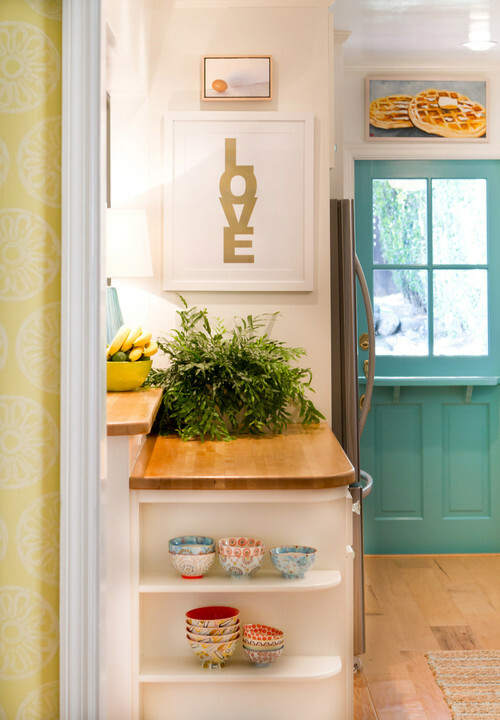 A painted cabinet provides great storage, and its glass doors keep it from bulking up the room. “Their daughter is a little trinket girl and had all of these little objects she’d found on her trip,” Neithart says. Glass jars corral the pieces and let her enjoy them. The wife no longer has to contend with the stress of the freeway and maintaining a larger home. “Now their home is really comfortable, easy to manage and easy to take care of,” Neithart says.